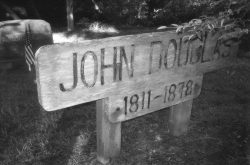 The recent outbreak of measles in Washington put me in mind of Mary Douglas, the daughter of Jalek, an Indian woman, and her husband John Douglas who was one of the first white settlers in this area. John, a cooper on a whaling vessel, had been to this area in the early 1840s, liked what he saw, and when he suffered an injury in 1846 – an injury serious enough to put him out of seafaring – he returned here and laid out a donation land claim on land just south of what would become Oysterville a few years later. 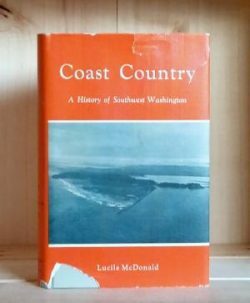 The story of Mary and the measles is best told by Lucile McDonald in her book Coast Country: Douglas built a “studdin’ ” of upright posts, with a cedar shake roof and an attic with a gable-end door and an outside stair. Is daughter Mary slept up there on a feather bed on the floor. An attack of measles had left her blind in early childhood. She had no medical attention until she was fourteen, when Dr. James R. Johnson (in 1854) began to practice across the bay at Bruceport. Douglas arranged for her to live at the doctor’s house for a short period. It was a fearsome adventure for Mary, who was dependent upon her mother. Her clothes were packed for the journey in a tiny trunk adorned with bright nailheads, which her father had brought from San Francisco. This was the only familiar object the blind girl took with her. That night she went to bed in the doctor’s house, lonely and disturbed, wondering how she would manage to dress in the morning in a strange place where she could not find her way by touch. Day dawned and Mary awakened. A miracle had happened. She could see again! 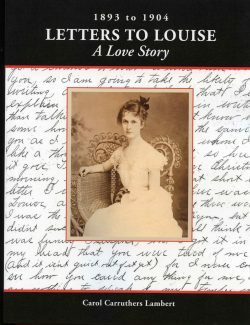 During the night the doctor had treated her eyes; likely some very simple thing had been wrong with them… By the time John Douglas died… Mary had become Mrs. Frank Garretson. Her daughter treasured the little trunk with the bright nail heads, taken on that miraculous voyage across the bay to Bruceport. 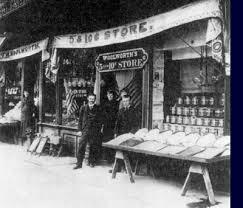 Frank Garretson was one of “The Bruce Boys” who entertained my great-grandfather, R.H. Espy in 1853 and who R.H. described as ” a clever fellow” which meant he was a good poker player! 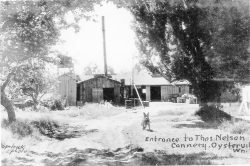 Frank and Mary’s daughter, Irene Garretson, married Tommy Nelson and lived across the street to the south of the Oysterville Church. When I was a girl, she and Tommy had a small cannery behind the house and, in the late 1940s, canned gourmet quality smoked oysters under the label “Espy’s Own” which was an enterprise of my grandfather Harry Espy’s and my uncle Willard’s. 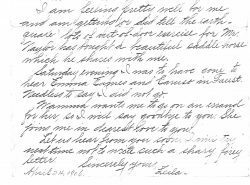 Also buried there is Dr. James R. Johnson whose daughter married Richard Osborne Goulter, our Oysterville neighbor Bud Goulter’s great-grandfather and making Bud Dr. Johnson’s great-great-grandson! So much has happened since Wednesday morning that I don’t know where to begin to tell you of it. 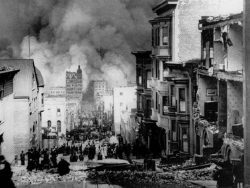 Sometimes when we think of it all it seems a hideous dream from which we will waken to find everything as it was a week ago and dear old San Francisco smiling at us from her sand banks and hills but, unfortunately, it is a grim reality and we do not yet know what the end will be. “So, you come from the beach,” she said. Not a question exactly. 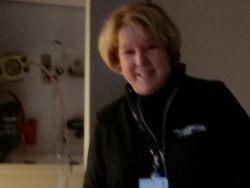 Susan Watkin, Family Nurse Practitioner, was one of the many workers who came in yesterday, one after another, to check on Nyel’s well being, his needs, his hopes for getting outta here. I didn’t pay much attention until the words “the beach” registered. I can’t wait to talk to her again today! No telling what we’ll learn from one another! Tucker outdid himself last night for his weekly “show and tell” part of our Friday Night Gathering! In fact, when the time came, he had to go home and bring the mystery object over in his car. 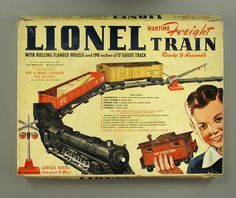 “It was too heavy to carry,” he told us and, as always, acted as though we might not really have time for this weekly highlight. He brought it in covered in a blanket and set it on the floor. The rest of us were totally mystified until he revealed… an old-fashioned cash brass register that was so shiny bright that there was an involuntary “Ohhh!” from the nine of us onlookers. What a beauty! But it wasn’t until he pressed the ‘Total’ button and the cash drawer opened with that never-to-be-forgotten “Ka-ching” sound that our nostalgia really kicked in. 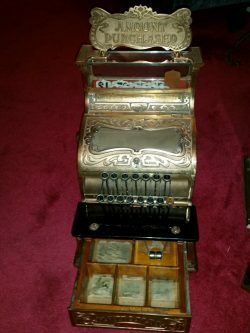 All of us were old enough to remember the days when purchases were made with real money and almost every store had a cash register – but perhaps not as grand as this one. It was made by the National Cash Register Company (which is still in business after 135 years, though now owned by AT&T.). According to the label on the bottom of the cash drawer, the register had been manufactured in 1904 for a specific (unnamed)c company who, as part of the terms of purchase, was obligated to buy any supplies such as ink and paper (cash register tape) solely from the National Cash Register Company. Ditto any repairs to the register. The highest amount on any key was $1 which made $1.98 the largest sale that could be rung up. This caused Tucker to believe that perhaps this particular register had been manufactured for a five-and-ten cent store – back in the day when most items at such a shop did, indeed, cost a nickel or a dime. The little round package fit right into the palm of my hand. It had been given to me just as I took my seat before the concert began. I had no idea what it was. In the dim light, as unobtrusively as possible, I examined the little parcel. It seemed to be made of a sort of plastic. To the touch it was reminiscent of my grandmother’s dresser set made of Bakelite – that precursor to modern plastic, developed back in 1907. I could feel raised letters/numbers(?) on the top and could almost make out what it said. It wasn’t until the intermission was over that I could take a good look. It was a little round box, black with a maroon cover. The lettering, curved to fit around the top and bottom edges said: TOOTH SOAP – Peppermint Flavor – Enolin (1926) Ltd. In the middle were the words: Specially Prepared For The Use Of H.M. NAVAL FORCES. Inside was a small cake of soap, apparently in its original cellophane wrapper. It, too, was embossed with letters reading TOOTH “SOAP/ENOLIN/FOR H.M. NAVAL FORCES. People gathered around. We all had questions. “Who would have been the king then?” we wondered. 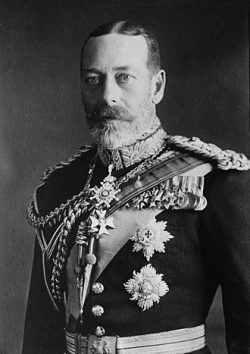 Later I found that it was George V, Queen Victoria’s grandson, who was, himself, a navy man and who was England’s king from 1910-1936. So, there you have it! 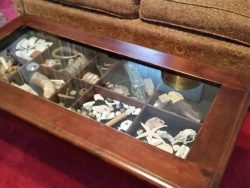 It will be added to the items on display in our coffee table – definitely a curiosity and far more urbane when compared to the broken bits of china and doll parts that we’ve found in the garden over the years. Elegance (of sorts) among the mundane! Thanks so much, Mike! Last night Tucker brought the BEST thing for his Friday evening “show and tell.” He called it a MOBO because that is what is painted on it, but none of us (including Tucker) had a clue what those letters might mean. And, honestly, I didn’t care because, just for a minute I was four years old and wanted to climb on that little MOBO in worst way! 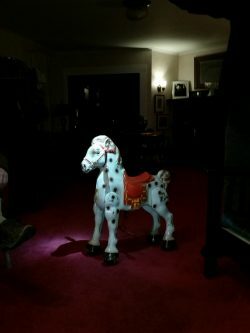 It was a little horse, suitable for riding by a small child (Me! Let it be me!) and, where the stirrups might be were footrests that you could push and the horse would move forward! And turn! (Giddy up MOBO!) 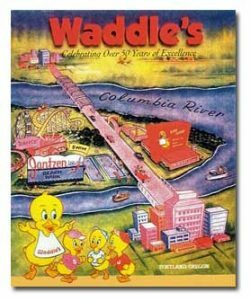 Tucker said that when he was a boy the Waddles Restaurant in Portland had several of these little horses that kids could ride around in a room set aside for the purpose. Although this particular MOBO hadn’t come from there – it was something Tucker found in an antique shop years later – it was just like the ones he remembered from his childhood in the ’50s. Wow! 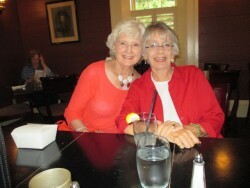 I actually felt a tinge of jealousy – that I had been too old in the ’50s, that I had never heard of the restaurant, and that I had never had the opportunity to ride a MOBO. Judging from some of the old pictures of me, however, I had lots of opportunities to ride other things. 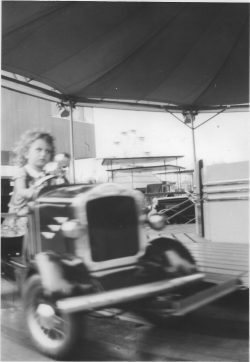 There I am in a cool car, I think on a merry-go-round at the New York World’s Fair in 1939! 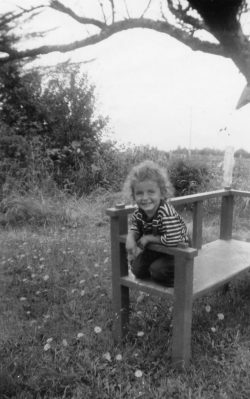 And there is another of me, taken that same year at Christmas in Oysterville, sitting on my first tricycle. 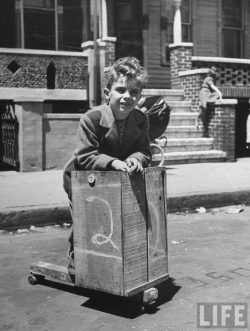 That was a big Christmas for me – a toy stove, a “cry baby” doll as big as I was, and my very first set of wheels. Bright red, as I recall. But… no MOBO! 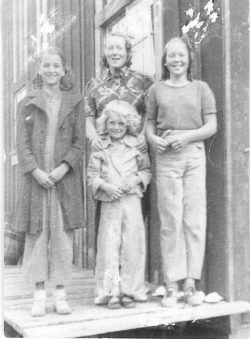 A few years later, in the summer of 1942, I went to Russian River with Mrs. Nagle who was our housekeeper/baby-sitter during the war while my mom worked at the shipyards. (She was a pipe fitter’s helper at General Engineering in Alameda.) I remember the day that my mom and dad came up to take me home and, as a special treat, I got to ride a pony that then posed with me for a picture. 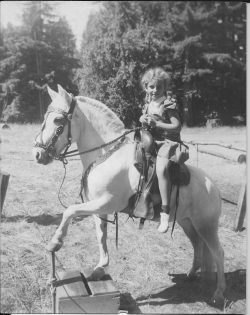 In the years that followed, there were lots of ponies and horses in my life – never belonging to me, but available to ride at Camp Willapa or, if I was lucky, in Oysterville when a friend would let me borrow theirs. But there was never a MOBO. Lucky Tucker! And who’da ever thunk a dignified (ahem!) 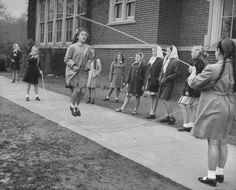 old lady such as myself would have such a nostalgic longing to be four years old again so she could ride a toy pony. Wow! There’s nothing quite like the thrill of getting an unexpected package in the mail, even at Christmastime. When the postmaster hands me a package all done up in brown wrapping paper, I still get that fluttery feeling in my stomach that I did when I was six years old. Only then, we were living in Alameda and the postman carried a big sack over his shoulder. When there was something in it for me, I felt like it was Christmas no matter what the time of year! Yesterday, there was no mistaking the shape and feel of a book under that plain brown exterior. The return address said that it was from my friend Memi (pronounce it Me-My) whose name is really Ann but, since I first met her in the late thirties or early forties, she’s always been Memi to me. Again, I felt six years old! But why on earth would Memi be sending me a book? I couldn’t wait to get home and rip off that disguising paper. A quick look in the index revealed so many familiar names… Bert Andrews, Glen Heckes, Ted Holway, Millie Sherwood, Gary Whitwell. All from my long-ago six-year-old past. And the stories! Oh my! About clam-digging when licenses weren’t required and there were no seasons. And about Tin-Lizzies and early day radio. A hundred-plus stories on 355 pages! It’s one of those books that’s hard to put down – a new story every other page. Perfect for a blustery Oysterville day by the fire. I can’t wait! (And I don’t really need to – it’s windy and stormy as all get-out here!) Thanks, Memi, for this wonderful gift! 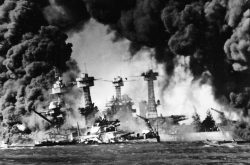 “December 7, 1941—a date which will live in infamy…” It was the day after Pearl Harbor was bombed and I remember listening to the radio as President Franklin Delano Roosevelt spoke those words to Congress when he asked them for a declaration of war. 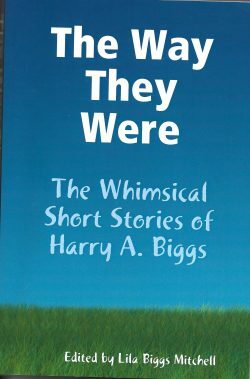 I was “five-going-on-six” and I remember it all clearly – the barbed wire on the beaches, the Victory gardens, the tinfoil drives, the air-raid wardens and rationing books, Kilroy, Lucky Green going to war, and being allotted only one pair of shoes a year – unless you were a kid. We got two. We hadn’t been at war – not with anyone—for five years, which at that point was my entire life. I had no idea what a Big Deal that really was. Perhaps no one else did either at the time. As it turns out, that five-year period from 1935 through 1940 has been the longest time the United States has been at peace in our 232-year history. 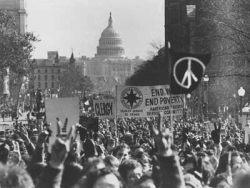 Both beforehand and afterwards we’ve had several periods as long as three years without being involved in a war, most recently 1976, 1977, and 1978 after the Vietnam War. But mostly… we live with war. IF you were born after 1978, you may have memory of two separate years that were not involved in a major war – 1997 and 2000. Other than that… not so much. 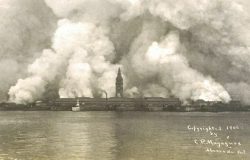 Since the United States was founded in 1776, she has been at war during 214 out of her 235 calendar years of existence. Yes, FDR had it right. We remember Pearl Harbor – at least some of us do. But how many more days of infamy have we forgotten? When did we and the rest of the world go numb? Perhaps it was when researchers began using their knowledge of how human emotion develops to try to build robots that can feel. But are they teaching those bots to remember? Especially, to remember the important things? Like Pearl Harbor.